The Numina Group's sortation systems are especially designed to meet the growing demand for both large and small order sizes, high shipping accuracy and more frequent shipments. In addition, they offer increased productivity, reduced costs and improved customer satisfaction. 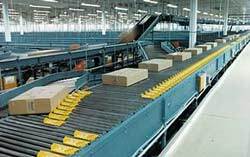 We represent a variety of automatic, high and low speed sortation conveyors. Numina Systems Corp., 60 Shore Drive, Burr Ridge, IL 60521. Tel: 630-323-0110; Fax: 630-323-0378.